The best way to get to the high level BT complaints department is to either write directly to the chairman or a member of the board. Or write to the address on the bill. While you are waiting to hear back from these letters go through the normal channels of ringing an advisor and insist on getting the complaint escalated if you are still unhappy with the outcome. Try and get the BT customer service rep / advisors name. However they may only give there first name for security reasons (or alternatively ask for their EIN number). Ask for their managers name and a contact number if they say they are going to ring you back, but most importantly you need a reference number for your complaint. Once again we take no responsibility for incorrect numbers or information on this page as this info was collected from forums but please comment below if any details are incorrect or you found an alternative way to get through and complain to BT. It seems quite a large number of people are unhappy with BT and I want to bring them all together and make a change to their attitude towards their customers. Please email me your contact details, who knows? Something has to change! Every month (without fail) I get an email from you saying that I have used so much of my Broadband allowance. Usually it is about half of my allowance. To my view, this is just scare tactics to try and persuade me to upgrade…..nothing more. Why don't you offer me a rebate for the allowance I have NOT used? I do find that very appalling. I telephoned BT a number of times as we were moving home and as our new house was not ready we no longer needed the phone or internet. After being on hold a number of times I finally got through only to be cut off. I tried again and after 20 minutes got through. After explaining my situation and being told I had three options, to pay a huge cancellation fee, leave my number in the old house and that the new occupier would "be very lucky as you would be paying their bill and internet so they would get it for free" or transfer it to my parents address where we are temporariily living and they would have the delight of loosing their number and they would pay a cancellation fee. After some discussion I asked what the complaints procedure was: At first I was told 'yes we have a complaints procedure'. I asked what it was, again just got ' we have a complaints procedure' on the third time of asking I was told 'there is no point in complaining as I wouldn't get anywhere with it. 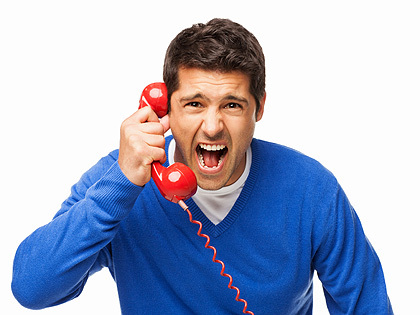 Calmly I asked was I not entitled to know the complaints procedure as a customer. I was told yes I was but still had to ask a fifth time what it was!!! At that point I said I wanted to make a complaint and wanted to know what the procedure was. I was still not told the procedure but that they would log I wanted a complaint and someone would contact me within 20 days….I am still waiting that call and the 20 days is nearly up! After this I asked was there anything I needed to know, I was told that the complaint was logged and someone would get in touch. At this point I asked how they would get in touch. I was told they would ring me on my land line….the one I had just cancelled and where I no longer lived. I pointed this out and said they should take my mobile number and had to give that.to them. Well you'd soon be complaining if you DID go over your limit and BT hadnt warned you! I guess some people just like to moan. BT is slow on all things like service care rolling out high speed brood band we have been promised this for two years now and on BT open reach web site it say they are tacking orders for it but when you try to order it they tell you its not ready for roll out yet?. BT is just a mess I think there in denial. I had the same email but when I went to 'MY BT' account to check how much I was using, it said the meter was not working so I would not be charged for any over usage that month. I tried this several times to find the same situation. When BT introduced their latest price hike (announced in November) I decided to leave them for a much cheaperr supplier. Despite what it says both in their contract and the leaflet announcing the price rise, I was charged for the remainder of my contract period at some huge, unspecified rate. When complaining I was told that this was because "I was transferring to another supplier". My complaints were then blocked by the tactic of sending a "deadlock letter" which said that BT would not have any more dealings with me. I started an online claim through the CCMCC (formerly County Court service). BT then settled my claim within a few weeks. This is a more effective procedure than going through OFCOM, BT have to follow the Court's rules. Don't stand for their nonsense – fight them. Bt are the worst company I have ever had to deal with! I agree, their system is designed to make the customer feel useless and powerless and still make money for BT. All they want is customers paying quietly without causing any disruption, stand up and fight your corner! Well you must have agreed to a contract, how it is BT's fault if you make the choice to move house and stop your service. Why agree to something you doubt you can see though! I contacted, via phone, their customer service. No response. This took over 30 minutes to finally get no response. By now it was after 8pm and they were closed but their online chat service was working so used that. Didn't take too long to contact someone in India. They seemed to handle my issue. They confirmed that they did indeed have my correct bank account details and told me to forward the email to phishing@bt.com. It bounced back as undeliverable. Contacted the same agent through the chat and she advised "just send it to abuse@bt.com". Same response – undelivered email. She then sent me a transcript of the chat we had and it said if I wanted to discuss further then simply reply to that email. I did and got another undelivered response. I contacted their online chat again (and was directed to the same agent), who said "yeah I'll help you" – it was approaching 9pm by now. Suddenly the chat was "re-queued" and nothing else happened for 10 minutes until I gave up waiting. The chat service finishes at 9pm. So, they are unable to fulfill customer service, in my opinion, on a number of fronts and simply dropping the chat because your shift has ended is totally unacceptable – at least explain to me that you are going offline and I should contact you at another time. Don't just leave me dangling. I expect better from a digital company in a digital age. Customer Service? BT do not know the meaning of those words. Your better off not having a mobile business phone and buying a sim card £20 f….ng joke when comes to support. My partner actually had a heart issue after trying for many days to get support re his phone. Be smart be wise these people only want your money and should have poorly heart the conclusion after dealing with this lot could be fatal – STEER CLEAR AND BW HEALTHY! Today is 27th Oct 2014. I receive, through post, a letter from BT Broadband. Letter Headline "Your free BT Sports is ending"
The contents say that from 11th November I must pay £6.75 for BT Sports unless I renew my BT Broadband contract. I only watch Bt Sport occasionally and as a pensioner I can ill afford another £6.75 a month. So I ring 0800 9173650 and am kept waiting as "they are very busy at the moment". When answered I tell them I no longer need Bt Sport and am informed I need to give 30 days notice. 30 days? But the letter only came today and thats only 15 days away so how do I give 30 days without paying £6.75. I can avoid this charge but I need to renew my BT contract for another year. Get Bt Sport free but be tied into another 12 month contract or cancel and still have to pay a charge because they send the reminder out late. Advert says free but small print says not unless you are tied into 12 month contract. Stitched up again by BT. Been with BT 30 odd years and worked for them for 22 years. I am utterly disgusted with BT as regards a total pack of lies from there staff as regards a supposed email apparently setting up a new contract term when I am totally computer illiterate and do not know that we even have a so called email. I have got a friend to type this complaint for me. I certainly have no paperwork sent from BT to tell me that my so called contract had been so called extended. i am not happy at all! i have just had infinity installed and was really impressed with everything until i noticed that the engineer caused damage to my carpet where drilling from outside but because i was so happy i didn't like to complain, but then today i was outside clearing leaves and noticed my large plant pot was in a different place to what it was before ,i noticed the area where the hole had been drilled through and my brick was very badly damaged a large piece missing and you could see he had clearly used clear adhesive to try to stick it all back and its a complete mess the whole brick will need replacing. Then trying to speak to the complaints department seemed an impossible task!! i now feel this company is very bad and wish i had not chosen them!!! hi i have recently had a bt infinity package installed i was very pleased with this until i noticed that the engineer has damaged my carpet whilst drilling through the walls i did not want to complain but today i noticed that the engineer has damaged my house brick on the outside tried to glue it back together with a clear thick adhesive and then covered it with one of our large plant pots. i did wonder why or whether the position to the plant had changed. i am really annoyed about this especially because i trusted this man i left my home unattended and to think he is so dis honest just makes me feel sick. I appreciate accidents happen but to cover them up without notifying the owner is unacceptable. Its quiet a large hole in the brick at least 5 inches in depth and diameter and then trying to speak to someone over the phone about this seemed impossible as most seemed to just ask about whether the connection is okay and completely ignored what i was telling them ( like speaking to robots) unreal!!! On November 1st 2015 I moved to a house where the previous owner had disconnected the phone line. On October 21st 2015 I applied for the phone line to be reconnected (for the small sum of £130) & cutting a long, painful story short I am still waiting today, 5 months later. Having no internet or phone is costing me money, is a massive inconvenience & causing strains on my relationship with my girlfriend. How is a company with such an appalling customer service & complete incompetence of staff allowed to be in control of the nation's phone lines? I suspect that if other companies were given access to connect phone lines then BT would be out of business within a few years – who in their right mind would want to be a customer of these clowns? I've had 4 cancelled orders since Jan for both broadband and phone, with Bt Blaming open reach and O/R blaming BT a number on cancelled engineer visits or no shows. Such a serious lack of respect for the paying customer. I've had 4 different phone numbers since Jan no working BB, no BT tv and lots of letters asking me to set up a Direct Debit ! Really, I think they've lost the plot, I'm now waiting for yet another engineer not to turn up tomorrow, I've placed 4 separate complaints for time wasting, no shows, rude staff, and the serious lack of compitance of their staff. How much response. Zero !! First rule of Broadband suppliers. Stay away from BT. Am very disappointed with BT service. Up till now our Broadband issues has not been resolved since the 1st August. I upgraded to BT Infinity since the 20th July and the Hub was delivered on the 1st Aug and up till now the Hub hasn't worked. We were told on Tuesday 16th that he has ordered a new Hub for us which we should get today 18th but instead the engineer was sent to us today and he couldn't resolve the problem. We have been without internet since the 1st Aug and no one is helping us and won't let us speak to the supervisor or manager. Our case and calls were not logged nor recorded. Each time we called we have had to explain the problem all over again. I work from home and I have had to beg my neigbours to use there internet to do my essential work. Thereis no BT rep or call centre in UK and no to help. We are at loose end now. This is my 21st day having moved house ,I am on contract for line,broadband, bt Sport so having been told my contract runs to Feb next year surprised having installed landline to be told other two products not been ordered (not really surprised) So far spent 4hrs and 27mins calling,waiting ,getting cut off.I run my biz from home 2days a week , was going to retire next year, but think I will bring forward before I have a heart attack! I placed an order for BT infinity 3, which is the superfast fibre BT offer but do not advertise. This order was placed at the beginning of May 2016. I was told the first part of installation would take place two weeks from when I placed the order and that no one needed to be present for this part. Turns out that was a lie and someone does need to be present! It was a waste of time anyway, because this first engineer ''couldn't'' do what came to do and additional work needed to be done. It is now mid July and I am still waiting for a single hole to be drilled! I have phoned the inept BT customer service on 3 occasions, and each time I have, 2 weeks get added on too my wait for an answer and installation. BT are lazy and their engineers more so. I am now stuck and do not know what more I can do??? and the main one being the lack of ability to have a meaningful discussion about their particular issue. The Indian call centres can reduce you to tears and if your issue is not about a bust router you are in trouble. As mentioned already it appears that BT customer service is at best deplorable and at worst specifically designed to keep you in the dark. However the complaints on here have been occurring for years and nothing has changed. Is there a way to move forward to make BT sit up and listen and improve their appalling service? Complaining to ourselves won’t do it. BT are probably the worst company to deal with. They are incompetent, their “advisors” lie, they never return calls as promised. Having a call centre in India is ludicrous as they have no geographical knowledge of the UK. They don’t listen to you. If I had a choice I would not deal with them or Open reach. Ive had problems with both bt and sky. Some time ago when i was with bt i received a letter saying my contract was up. So arranged moving to Sky as they were offering a free lg tv. I was in need of a tv so thought this was a good move. So i arranged everything with Sky and just had to call bt to sort my mobile. I rang bt and was rudely told my contract was not up and id have to pay exit fees. I ended paying exit fees. Then with Sky i was not told anything about having to claim the tv or that id get an email about the tv. The engineer said another company will deliver the tv. Unfortunately my email was not working so missed out on the tv. As a single parent i could not afford exit fees then to not be able to have the tv either and neither company acknowledge my complaints properly was extremely disappointing.